httpd.conf Missing or Empty : Fix! The Customize Windows > Computer and Internet > httpd.conf Missing or Empty : Fix! There are lot of misunderstandings with Apache Webserver Software; which we believe to be the root cause of inviting other web server softwares; which are probably not so much tweak able like Apache. Later we performed a search on httpd.conf Missing issue and found to be a very common complain! Historically, if we installed Apache2 via sudo-apt-get install command, we used to get an entirely different set of files and directory structures than if we download the binaries, unzip it and build it manually. If we download from the Apache site, we used to get an httpd.conf file. 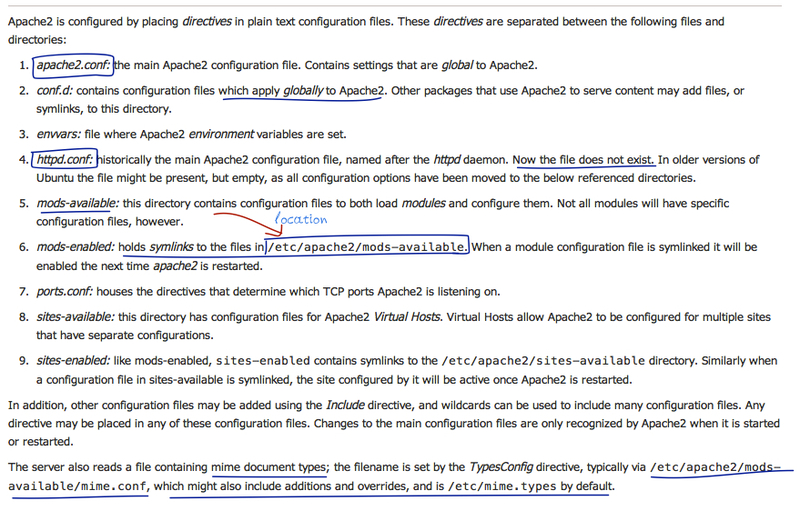 httpd.conf is usually the main configuration file for the Apache web server. This is the case for Red Hat Enterprise Linux (RHEL), CentOS and our OS X. But not on Ubuntu and certain deb based Linux. We guess it solves the httpd.conf Missing or Empty problem. This Article Has Been Shared 4750 Times! Articles Related to httpd.conf Missing or Empty : Fix! Using Facebook From Command Line Interface adds the advantage to minimalistic text only mode with faster loading mode. You can test it on your computer too. Title: httpd.conf Missing or Empty : Fix! Cite this article as: Abhishek Ghosh, "httpd.conf Missing or Empty : Fix!," in The Customize Windows, April 10, 2014, April 26, 2019, https://thecustomizewindows.com/2014/04/httpd-conf-missing-empty-fix/.